Young Wangari was taught to love and respect mugumo (trees). Trees are home to many and provide food. In addition, the Kikuyu people of Kenya believe their ancestors live in the shade of trees. When Wangari began attending school—something most Kenyan girls weren’t allowed to do—she excelled. Science was her favorite subject. Her education in Kenya eventually lead her to the United States where she attended college and later became a teacher at a university. But Wangari never forgot her childhood teachings, and she never stopped loving trees. When she returned to Africa, Wangari was saddened to discover her people had turned their backs of the custom of not chopping trees down. With the loss of trees, the land was destroyed, food sources dried up, children were hungry. Wangari put her education to work and organized other women. Together they saved the land and her people, one tree at a time. 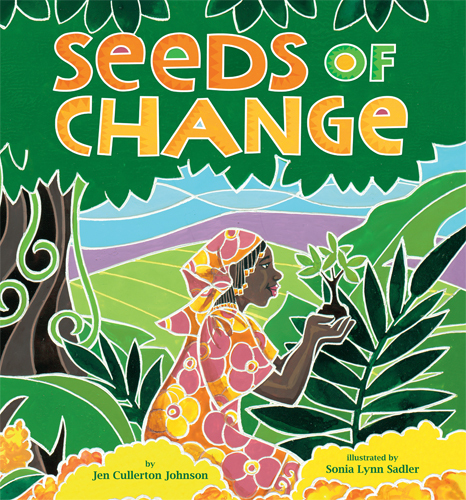 Jen Cullerton Johnson introduces readers to a little-known but important African heroine, a Noble Peace Prize winner and environmentalist. Illustrator and fine artist Sonia Lynn Sadler’s artwork is bold and colorful. Her rich paintings bring stained glass to mind. Adrienne, Keesha, Michael and Tommy are best friends. They live on the same street in New Orleans, a close-knit community where everyone knows each other, and everyone says hello. In alternating voices, four friends describe their life before, during and after the storm. 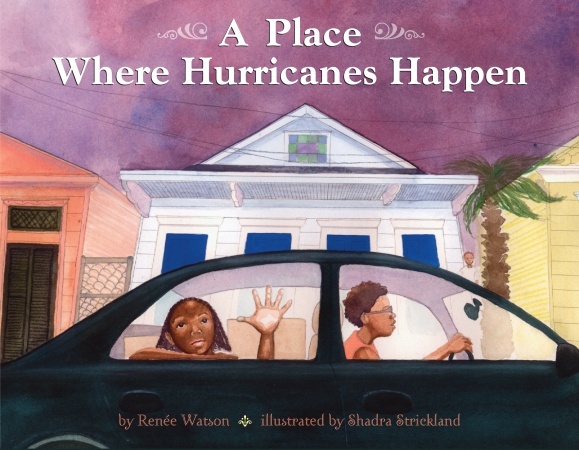 Renee Watson’s emotive story serves as a reminder that it’s not things that make a community—people do. Shadra Strickland’s mixed media illustrations successfully capture the emotion of the story. A stunning double-page spread illustrates the enormity and devastation of the flood. The World Cup is an international football (soccer) competition. And it’s happening right now, which makes this book report especially appropos. 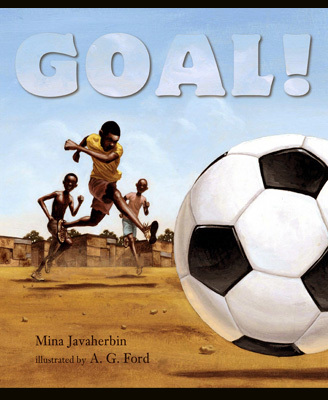 Set in a dusty alleyway of a South African township, Anjani and his friends prepare to play football. They kick, dribble, run and score with Anjani’s brand new federation-size football, a prize won for being the best reader in class. But the alley isn’t safe and the friends must keep an eye out for bullies. When they are approached by a group of older kids who want to steal their ball, a new game is on as the younger kids whip the bullies at their own game. Goal! is Mina Javaherbin’s debut in the children’s book market, and she scored a big win. A.G. Ford’s oil-painted illustrations are full of energy and emotion. In my opinion, his best work to date. Around Our Way: It’s a Book Birthday!